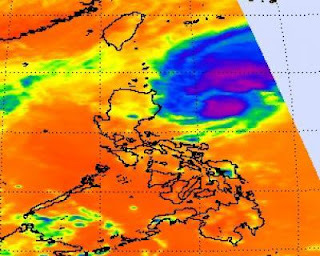 When NASA's Aqua satellite flew over the Philippine Sea during the early morning hours today, November 2 infrared imagery saw another new tropical cyclone coming together. The U.S. Navy's Joint Typhoon Warning Center, the organization that forecasts tropical cyclones in that area of the world is getting a workout. 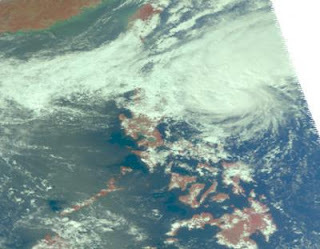 Tropical Storm Mirinae just made landfall this morning in Vietnam, and had crossed northern Luzon, the Philippines this past weekend. Now, there's another threat in the region. At 0600 UTC (4 p.m. local Asia/Manila time) on Monday, November 2, "System 97W" appeared to be taking on tropical cyclone characteristics. In fact, the Philippine Government hasn't waited for it to be named and gave it the local name "Tino." Tino, or 97W was located about 320 miles northeast of Manila, Philippines, near 18.0 North and 120.8 East. It was moving in a westerly direction toward the Philippines and the outer fringes of 97W's clouds are already moving into the northern areas of Luzon. NASA Aqua satellite's Atmospheric Infrared Sounder (AIRS) instrument takes the temperature of the high thunderstorms within a tropical cyclone. Knowing the height of the cloud tops is important to forecasters because the higher the cloud tops, the stronger the thunderstorms. The infrared imagery also showed that the strongest thunderstorms were in the storm's southern and northeastern areas. Those cloud tops had temperatures colder than -63F. Typically, the northeastern quadrant of tropical cyclones pack the strongest winds, too.